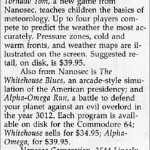 Thanks to Hedning for flagging this game up, but in COMPUTE’s Gazette May 1985, page 147, a game called Tornado Tom was flagged up. We know little about the game at present – but here is the scan from the magazine thanks to Peter Weighill. So just an entry for now to make it known we are looking to find out more about this game! Did this game ever get released or was it canned early on? More soon on this one we hope!